Annie Marcum received her 200-hr yoga teaching certification in September of 2012. Since then she has been studying and learning from different teachers throughout the country and abroad. She found iRest, a research-based transformative practice of deep relaxation and meditative inquiry, in November of 2015 after a personal traumatic experience, and has been so grateful for the events in her life that brought her to this practice. iRest has shown Annie the immense peace, stillness and ease that lies within, that is untouched by the traumatic experiences of life and can always be accessed. She is currently in the iRest certification process, with hopes to be fully certified in 2018. Where are you from? I am from Ohio, outside of Cinncinati. What’s your passion? My passion is to be an example of love and kindness in the world and to see that in others—to bridge a connection of love and kindness. I started in 2007 when I came to UGA. At first I was intimidated by the new practice, but I soon found my community and felt seen and supported to explore my newfound love! Yoga felt like the switch from looking outside to looking inward and discovering my lifelong practice of getting to know myself. 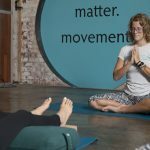 Restorative yoga with iRest meditation! I’ve taught for six years. My inspiration was Cathy Jackson; she is an incredible human and teacher. My first class was with her was in 2010. My other inspiration is that I wanted to give back to the world and teaching yoga is a way to do it. Go for it. Don’t think too hard about it. Don’t be scared. It’s about you and your body. As long as you’re comfortable with it, keep going. I don’t know that I have one. For me, yoga doesn’t have to be about a pose, so my favorite pose is the experience. iRest is my favorite class to teach and I love taking Super Stretch! I enjoy the community aspect of M3, the welcoming nature of both students and teachers. M3 makes people feel seen, heard and connected with, exactly as they are. M3 feels like a family of all different kinds of people who are brought together for the intention of creating connection within themselves and throughout the community. I’m so grateful for M3!